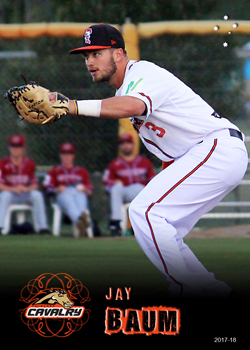 Baum is an American import who played with the Canberra Cavalry during the 2017-18 ABL season. Baum had previously spent four years in the Seattle Mariners' farm system before being released in 2017 after a stint with the Arkansas Travelers in the AA level Texas league. He completed the American season playing with the Sussex County Miners in the independent Canadian-American Association before joining the Cavalry.